The biological therapy used for treating various kinds of severe and chronic conditions are known as monoclonal antibodies. These are applied in the treatment of serious conditions such as cancer, rheumatoid arthritis, Crohn’s diseases, psoriasis, osteoporosis, systemic lupus erythematous and others. These are target only the affected areas to destroy the diseased cells, thus restoring the immune system. The research report by Transparency Market Research states that the global monoclonal antibody therapeutics market was worth US$86.7 bn in 2015 and is expected to reach US$245.8 bn by 2024. Between the forecast years of 2016 and 2024, the overall market is expected to rise at a CAGR of 12.6%. The rising incidence of cancer across the globe is expected to drive the global market in the coming years. According to the World Health Organization, the world is expected to witness a rise of 70% in the number of cancer cases over the next few years. The statistics indicate that of these, 60% will be from Asia, Africa, and Latin America. The market is also likely to be favored by the growing approvals to research and develop new antibodies, especially across Europe and the U.S. Additionally, commercialization of these drugs will also contribute to the growing revenue of the global market. On the basis of application, the global monoclonal antibody therapeutics market is segmented into cancer, ophthalmological diseases, infection, autoimmune diseases, and hematological diseases among others. Of these, demand for treating autoimmune diseases with monoclonal antibody therapeutics is expected to remain at an all-time high in the coming years. The growing awareness about diseases, improving accessibility to healthcare, widening range of monoclonal antibody therapeutics, and huge investments in research and development of these therapeutics are expected to propel the segment in the coming years. Cancer is the second largest segment in the global market due to the high prevalence of the disease and an urgent need to treat the same. In terms of geography, the global market is divided into North America, Europe, Asia Pacific, Latin America, and the Middle East and Africa. Analysts predict that the North America monoclonal antibody therapeutics market is likely to lead due to several reasons. Europe is expected to follow suit. As of 2015, the collective share of these two regions stood at 62.7% in the global market. The vast pool of geriatrics, well-established reimbursement policies, affordable healthcare, and growing awareness of diseases is expected to drive the market in North America in the coming few years. 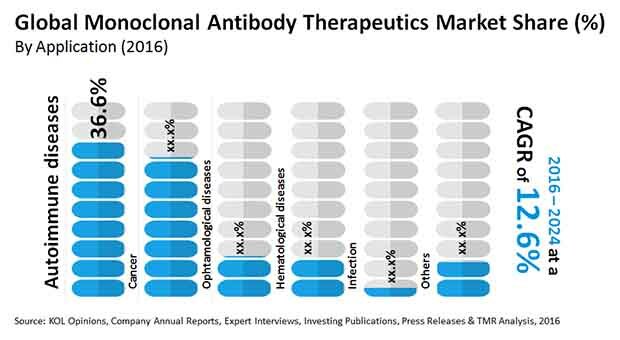 On the other hand, Europe monoclonal antibody therapeutics market is expected to thrive due to the increasing research and development in developing novel products. Asia Pacific is also expected to show promise of a steady growth as the region has a huge population base with vast scope of unmet medical needs. The growing focus of governments in developing countries to improve the healthcare facilities is also expected to boost the demand for monoclonal antibody therapeutics in the coming years. The key players operating in the global monoclonal antibody therapeutics market are GlaxoSmithKline Plc., Bayer AG, Pfizer Inc., F. Hoffmann-La Roche Ltd., Sanofi, Merck & Co., Inc., AbbVie Inc., Novartis AG, Amgen Inc., Bristol – Myers Squibb Company, Johnson & Johnson, and Biogen Inc. among others. The players are expected to focus on strategic mergers and acquisitions in the coming years to improve their foothold in the global market. The market report comprises an elaborated executive summary, which includes market snapshot that provides information about various segments of the market. It also provides information and data analysis of the market with respect to market segments based on application, source, end-user, and geography. The market overview section of the report analyzes market dynamics such as drivers, restraints and opportunities that influences the market in the current and future scenario. This report analyzes the current and future prospects of the market based on type of application, source, end user and geography. By application monoclonal antibodies are segmented according to the therapeutic area such as cancer, autoimmune diseases, infection, hematological diseases, ophthalmological diseases and others which include monoclonal antibodies used in treating cardiovascular, respiratory, and orthopedic disorders as well as monoclonal antibodies used in the prevention of transplant rejection. The research is a combination of primary and secondary research, conducted for understanding and arriving at trends, used to forecast the expected revenue of the major market in the near future. Primary research formed the bulk of our research efforts with information collected from in-depth interviews and discussions with a number of key industry experts and opinion leaders. Secondary research involved study of company websites, annual reports, press releases, investor presentations, analyst presentation and various international and national databases. Market share analysis among the market players is analyzed to signify the contribution of these players in the market in terms of percentage share. All these factors will help the market players to decide about the business strategies and plans to strengthen their positions in the global market. Based on geography, the market has been analyzed for major regions: North America, Europe, Asia Pacific, Latin America, and the Middle East and Africa. The study also covers detailed country analysis contributing majorly in the market.